Drivers are being asked to survey their local supermarket car parks in a bid to reduce the number of motorists using disabled bays without a Blue Badge. The campaign - dubbed Baywatch and led by Disabled Motoring UK - is intended to put the pressure on supermarkets to increase their enforcement of disabled parking spaces. The charity is asking as many people as possible to survey their local supermarket car park over one month in June 2019. It will require participants to count the amount of disabled bays provided and how many cars are parked in them without displaying a Blue Badge. It will also require details on the type of enforcement carried out by the parking operator responsible for the car park. These details will be displayed on signage near the disabled bays. 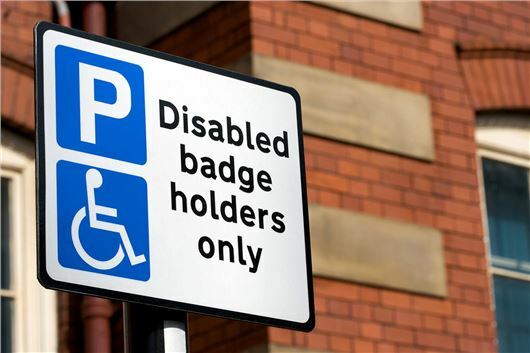 New rules around Blue Badges being introduced in 2019 will see people with hidden disabilities being given the right to park in disabled spaces. These include those with mental health conditions and autism, for whom parking in a busy environment can cause an overwhelming amount of stress. The new legislation will create increased demand for existing disabled parking spaces, says Disabled Motoring UK, which means "it is now more important than ever that disabled bays are enforced properly and effectively to ensure that only genuine Blue Badge holders are using them." The campaign, which has been running since 2002, has attracted the support of Paralympian Baroness Tanni Grey-Thompson, who said there was a "real lack of understanding about how essential these bays are to disabled people." More information about the campaign can be found on DMUK's website. Blue badges rules don't apply in supermarket car parks. I know these people are obviously doing the survey to lobby for them to, but that then goes against the Equality Act. Whether or not the rules apply, it speaks volumes about anyone who would abuse the disabled parking bays because they are too idle to walk a bit further. "Take my space, take my disability"
They have the space to open the doors of the car too. If the supermarkets had wider bays for the entire car park, this would lessen the problem. Blue badge holders use Mother and Toddler bays when their own bays are free. They have no thought for struggling parents. "Mothers" are invariably young and fit. Disabled people need a WIDE space in order to open the door wide enough to get out of the car or to lift out a disabled 'vehicle' of some kind. We are told to use them by the Supermarkets, when the Disabled Bays are all full. So maybe you just got there at the wrong time. I am a Blue Badge holder and I block in cars using disabled bays without a badge. Years ago, when I was fit and well. I used to complain vociferously to the manager of a local Tesco about why they did not do anything about non-disabled people pinching blue-badge places. None displaying cars should be clamped and fined...that would sort out the problem. You sound like an angry and obstinate driver who like the idea of confrontation . I hope you never have the misfortune to block me in ! I am waiting to have both knees replaced and some days are worse than others so yes on those days I use disabled parking. There is a major problem with these matters, unless you have been the one getting abused by a fit driver, just because you have pointed out it is for those registered disabled, you won't fully understand why a disabled driver can be driven to extremes themselves, and I am not getting into the rights and wrongs, as they are all a given, I'm just pointing out there is more than one side to this, although I do agree it's not good practice to take that approach. And your situation is another that is a hard one to call, although you don't have the 'right' to park there, you can certainly understand and appreciate it, as many have a battle to get their badge, and struggling for years in some cases who also use the disabled bays as well out of desperation, then you get some like me, to look at me you would wonder what was wrong with me, because over the decades people have had someone in a wheelchair as the base line for using such bay's, or having some very noticeable condition, but what they don't see is what happens when you get home, where I have to take some more Morphine for the pain of going shopping and lay down on the settee for several hours to get my energy back a little, so it's not always black and white. The whole are around blue badge allocation needs addressing. I fully agree with doing something about people parking in disabled spaces who don't have a blue badge. However there are many people with badges who shouldn't have them. I cannot understand how somebody with a badge can park in a disabled bay and then walk around the shops for a couple of hours. It is not long ago that the allocation of Blue Badges was reviewed. Existing holders were subject to questionnaires, and then interviewed by qualified health-care professionals. Mis-use of badges has always been a problem but , in my town, this is subject to frequent “raids” by council officials who catch and prosecute the offenders. Also those badges were confiscated. One if my Friends has Kidney failure and has to go for Dialysis 4 days a week! He can walk for now. Would you take his Badge away? People who abuse disabled spaces should be fined, named and shamed. However my late brother was disabled all his life and was totally dependant and clearly disabled. This makes it difficult for me defend disable spaces as almost without exception the people I see using them are clearly quite mobile and have no difficulty getting about. My point is simple that in many cases badged cars are used by people who don't hold the badge or the badge has been given far too easily. I know this is an emotive subject, but these spaces are there for a reason and when the people using them are clearly quite mobile then that undermines the case for the genuinely and clearly disabled wheel chair user for example. Abuse of the badge should result in it being withdrawn and the criteria for giving out badges needs to be rigorously enforced as it undermines the real disabled user. People who abuse disabled spaces should be fined, named and shamed. However my late brother was disabled all his life and was totally dependant and clearly disabled. This makes it difficult for me defend disable spaces as almost without exception the people I see using them are clearly quite mobile and have no difficulty getting about. My point is simple that in many cases badged cars are used by people who don't hold the badge or the badge has been given far too easily. I know this is an emotive subject, but these spaces are there for a reason and when the people using them are clearly quite mobile then that undermines the case for the genuinely and clearly disabled wheel chair user for example. Abuse of the badge should result in it being withdrawn and the criteria for giving out badges needs to be rigorously enforced as it undermines the real disabled user. My Wife is clearly Disabled, I believe there should be bays for wheelchair users only! And that all other Disabilities should have a separate Scheme. It really is the lowest of the low to take a disabled space when you’re not entitled. There was a perfectly able bodied man in his 20’s who I spoke to at Morrison’s, Totnes on Friday 29th March who had waltzed up to a disabled space in his black 1-series BMW (heap). When I questioned him he simply smiled and said “it’s ok, I’m just going to the cash machine”. He couldn’t care less. When I pressed him as to why he felt entitled he just said he’d do what he wanted and hurled unprintable abuse. Charming! But it won’t stop me challenging the next miscreant. Good luck with your campaign DMUK. It really is the lowest of the low to take a disabled space when you’re not entitled. There was a perfectly able bodied man in his 20’s who I spoke to at Morrison’s, Totnes on Friday 29th March who had waltzed up to a disabled space in his black 1-series BMW (heap). When I questioned him he simply smiled and said “it’s ok, I’m just going to the cash machine”. He couldn’t care less. When I pressed him as to why he felt entitled he just said he’d do what he wanted and hurled unprintable abuse. Charming! But it won’t stop me challenging the next miscreant. Good luck with your campaign DMUK. Take a Photo on your Phone of the offending Vehicle and hand it in to the Authorities and send it to the Supermarket head Office. As I said before, Good Supermarkets do Police the Bays and if you point out an offender to Security they will at least have them on CCTV if the offender has gone before they can get to them. I have a problem finding an empty disabled bay at my local Tesco. I complained to the senior manager on duty and was told it was not the policy of Tesco UK to enforce marked bays for the disabled or parents with children. As I said Good Supermarkets do Police the Bays! A problem here in Duns Scottish Borders is the continuous use of one of two disabled spaces by a disabled lady who lives next to the space she uses. Her car hardly ever out of the space and because of that all disabled drivers here are more or less permanently deprived of a space. Despite telling her to place her car in the next non disabled space in the evening when it is available she refuses to do so as she says she has every right to park the way she does. It is annoying everyone and it is time that a time limit is placed on these spaces which may cure this particular problem. As it is our local council do not want to know as they say she has permit and cannot be moved. Shame. I have holidayed in Duns and always found the people very friendly and polite. Only takes one! I can never understand why you are allowed to park on double yellow lines with a blue badge. Yellow lines are there to aid traffic flow, etc by stopping people parking. So why are you allowed with a blue badge? sometimes when visiting doctor, dentist, etc you have no choice. You cannot just make a car disappear. How about bringing back the Invacar? They were narrow, less expensive for the government to provide and there would be no need for blue badges! It would be amazing to see how many people all of sudden stopped being " disabled" . Yes before the disabled "voice" starts I fully appreciate that there are a lot of very genuine people who are disabled and need a badge. However there are quite a few who aren't and spoil it for those who are. If there is a vehicle occupying a “disabled space”, and not displaying a badge, take a picture of its number-plate, and one showing that it is in a disabled bay, and send it to the local council. The Tesco near me has always got undisabled people parking in the disabled spaces. Usually workmen eating and drinking with feet up on the dashboard. I go out early in the morning.I have a disabled badge and get really frustrated and angry because I am always complaining in Tesco but nothing is done. One day there were about 5 cars without badges, so I went along and wrote down the car numbers to give in to the customer services. While I was doing it a woman came up to the car I had just got the number of. She asked me what I was doing so I said I was writing down all the cars who do not have a badge. She told me to mind my own f..... business. I told her it was my business as I am disabled and am fed up with having to tour the car park to find another place to park. She said her father has a badge. I looked in her empty car and said 'is he invisible'? She said he was not with her then so I said she had no right to park there then. She told me to get a life, which I thought was funny as my car is a little Japanese import. It is a Honda Life so I pointed to my car and said I already have one. She slammed the car door and drove off in a huff. I have noticed how many high value cars park in disabled spaces, usually displaying some sort of disabled sticker. Is this another aspect of the disabled parking scam? Don't let a cars value (cost) cloud the issue, money doesn't change a disabled persons condition, it just means they can be disabled in a nice car, but I do see high value cars seem to think the law doesn't apply to them as they have money, so that side of it I totally agree, but there is a further reason why you see 'expensive' cars in disabled bays, I drive a Mercedes, not because I have money, far from it, I was housebound for 2 years saving for it after my previous car died, and it is nearly 20 years old. But has a private plate (nothing that is special), purely coincidental as it came with the car, but I don't drive it to be flash, I drive it as I need the support and features to be more able to drive comfortably, as opposed to driving in excruciating pain like my last car, so just remember until you are in a position like this, you won't truly understand such points, no different than I did at times before being on the other end of this situation when I had my health. Mental health problems will open a whole can of worms. I better get around the GPs and find out what my mental health problem is. I see disabled bounce around ASDA just like I do, and wheel a big, full trolly back to their car. They aren't disabled enough to make shopping at ASDA difficult, so why give them a premium space? And this is most of them. Motability is a con as well, primarily to keep car sales up. I'd make all Blue Badges holders take a driving test to prove they were fit to drive.. The waiting area for cars collecting passengers at my local station is about 30 paces from the entrance. The disabled bays are right outside. Guess where all the muppets wait when they go to collect someone from the station? What a can of worms this is, to everyone please, please show everyone some compassion and empathy. "Treat other road users how you would like/expect to be treated yourself"
From a Blue Badge holder with a fairly hidden disability. Actually Good Supermarkets have external monitors to Police their Disabled Parking Spaces, and when they are all legally occupied the say we can use the Mother and Child Bays. Also the Blue Badge Rules do apply, just as all other Motoring Law does! You wouldn't like it if someone damaged your Vehicle and turned round to you and said "motoring law doesn't apply in Super Market Car Parks" would you! These Blue Badge "rules" are actually laid down in Law! And we have Rules to abide by as well, such as not using the Badge if the Disabled Person is not with us, and not leaving the Disabled Person in the car whilst displaying the Badge and nipping into the Shop etc. So Think when you want to walk just a short distance to get Cash. You have just hit the nail on the head about the the disabled person being with the car or not, and the biggest offenders I have seen, are taxi drivers, because they often do school transport, and have the badge for use when carrying children to and from school, but they often abuse this by going shopping for themselves, but using the disabled badge that is for use when transporting children who qualify for the badge. Yes they do and good Supermarkets Police them! They do apply, at least I have seen it in practice, I don't know if it varies around the country under different councils etc (I don't know the regs about this), and more so the store itself (thinking of smaller chains), I know these places are 'private' land, and I was also under the understanding as you appear to be, but then a couple of years ago as I was getting in the car after getting my shopping in the car, I saw a guy ('meter maid' ?) coming along the disabled bays looking at the cars, and I saw him write a ticket and put it on the car, and everything looked and acted as an official service, as opposed to rogue clamper's who are the ones that need stopping. So I continued to watch given the previous understanding getting a wake up call, and he did another, then as he came past my car, he started to write another ticket a few cars down from me, so coming out of my bay to go home, I pause and put my window down, and asked him about it, given the previous understanding, and he said they do come out and do issue tickets on cars in the disabled bay without a valid badge in the screen. I said I had never seen or heard of it before, and he said they do what they can, but with the usual cut backs they don't get out as much as they should (he was not stationed in the store in any way), he told me more detail than I can recall after this time, but a quick search quickly showed supermarkets (the big ones at least) are in fact enforcing the letter of the law (best term I can think of), and issuing tickets to those who should not be there, needless to say I gave him a well done and went off with a smile on my face. "Blue badges rules don't apply in supermarket car parks"
Get a blue badge now or else there will be nowhere for you to park. Nearest large supermarket always has 20/30 unused disabled spaces and everyone else has to cruise round looking for a spot.